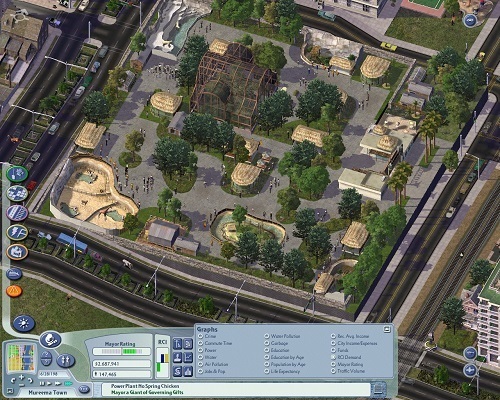 SimCity 4 is the 2003 release in the SimCity franchise and gives players free control over their city and the landscape as they create their dream city design. Fans of the series will appreciate the new features in the game while newcomers will enjoy the streamlined approach to some mechanics that make it more accessible. As with past SimCity games you step into the role of mayor in a city that needs development. Depending on the game mode and the settings that you choose you’ll either have to start from scratch or have some infrastructure already in place. With tools to develop land into residential, commercial and industrial you’ll have to shape the game area into a productive and efficient city. This requires players to carefully manage the finances of their city while also paying close attention to the happiness of their residents and the environmental impacts of your city. In order to keep your citizens happy they’ll need adequate housing, good public services, utilities connected to their houses, a robust transport system and much more. With plenty of things to manage you always have decisions that need to be made and you’ll find yourself reacting to the dynamic elements of the game as they arise, there is always a new challenge (much like in the real world). The game is definitely one of macro management with lots of micro elements being streamlined to keep you focus on things that matter. Zoning has been simplified while buildings snap to be aligned with roads to make the whole building process much faster. 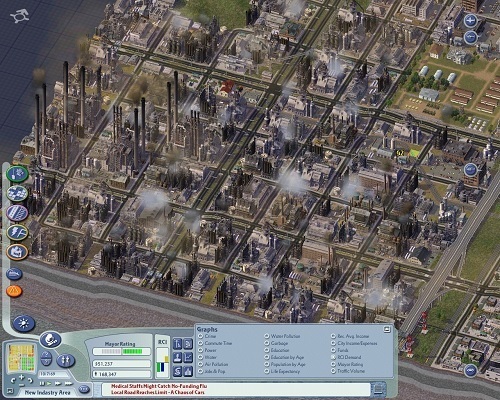 SimCity 4 has also done a great job at ensuring no building is ever vacated completely with its simulated urban decay that lets old buildings be refurbished. SimCity 4 is definitely the peak of the franchise and is a must play for any city building fan or newcomer looking to get started. It’s definitely a game that breaks the city building shackles to deliver a city simulator ahead of everything else in the genre. Huge number of options that let you create exactly what you want. The best in the SimCity franchise. Balance the residential, commercial and industrial needs of your city. Not just a city builder.